The second to last event in the 2011 IZOD INDYCAR Series season, the open wheel racing tour has arrived at the Kentucky Speedway with a full field of contenders. With 29 cars entered in the Kentucky Indy 300, primary attention will be directed to the season-long fight between Dario Franchitti and Will Power for this year's IZOD INDYCAR Series overall championship. 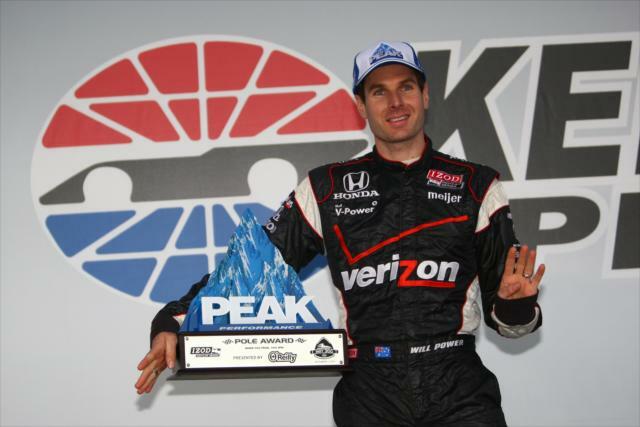 Separated by only 11 points entering Kentucky, Will Power gained the points lead after the Japanese event at the Twin Ring Motegi road course. Following a self-professed "stupid move", Dario Franchitti spent much of the event recovering from a INDYCAR-issued penalty while Will Power followed race winner Scott Dixon in second place all-day. Coming at right the right time for the Australian driver, Will Power gained the advantage in qualifying for the Kentucky Indy 300 race. Taking his #12 Penske Racing car around the 1.5-mile tri-oval in just 48.5948 seconds, Power was the only driver to record a time faster than 219 miles per hour. An eighth pole for the 2011 IZOD INDYCAR Series season, this is Power's first top qualifying result on an oval since the 2010 Iowa event. Starting in second place, Service Central Chip Ganassi Racing car of Graham Rahal was about 0.21 seconds slower than Power's pole time. A front row spot for the Kentucky Indy 300, Rahal has placed the #38 car into a top-3 starting spot for the 3rd straight IZOD INDYCAR qualifying session. Despite strong runs in the past two races in qualifying, race results have been tampered by unfortunate developments. Rounding out the top-5 in qualifying for the IZOD INDYCAR Series Kentucky Indy 300 is Canadian driver James Hinchcliffe, Ed Carpenter and JR Hildebrand. Other notable runs performed in qualifying worthy of honourable mention came from Charlie Kimball in 10th, Simona Silvestro in 13th and Wade Cunningham driving the #17 car for Sam Schmidt Motorsports. As for Sam Schmidt Motorsports #77 car, Alex Tagliani is a healthy scratch from the team in preference of 2011 Indianapolis 500 winner Dan Wheldon. Announced to be driving the #77 car at the Kentucky event less than a week ago, Wheldon's limited time with the team was reflected in a 28th place starting spot for the 300-mile race. Dan Wheldon's main purpose in the Kentucky Indy 300 is to gain preparation for the upcoming Las Vegas event where he holds the key to a 5 million dollar challenge issued by GoDaddy.com. In the important championship points battle for the 2011 IZOD INDYCAR Series, the pole-sitting Will Power who start comfortably ahead of Dario Franchitti's #10 car. The Scottish Target Chip Ganassi Racing driver was only 11th fastest on the day. The Kentucky Speedway his not been historically strong for Franchitti with 5th place effort in 2010 being the strongest finish in 6 races at the track. The Kentucky oval was also the scene where Dario Franchitti crashed spectacularly in 2007 running for Andretti Green Racing. Prepared to run 200 laps around the 1.5-mile tri-oval track, the 2011 IZOD INDYCAR Series race is set for 2:45 PM Eastern time start Sunday.